North of Green Lake, West of 43rd Street, West of Fairchild Avenue after the Northern intersection with 43rd Street, North of 46th Street/Otter Lake Road, and West of the boundary with Training Area 415. If you have any questions about these closures or areas, please call Conservation Law Enforcement at 907-552-8609. Visitor Center Kiosks are available at the Richardson and Boniface Gates. These kiosks can be used by anyone to register, buy and print recreation permits, and access the iSportsman.net website. The iSportsman registration is required for everyone 16 years and older, to include military members or retirees, DoD affiliated civilians and the public. 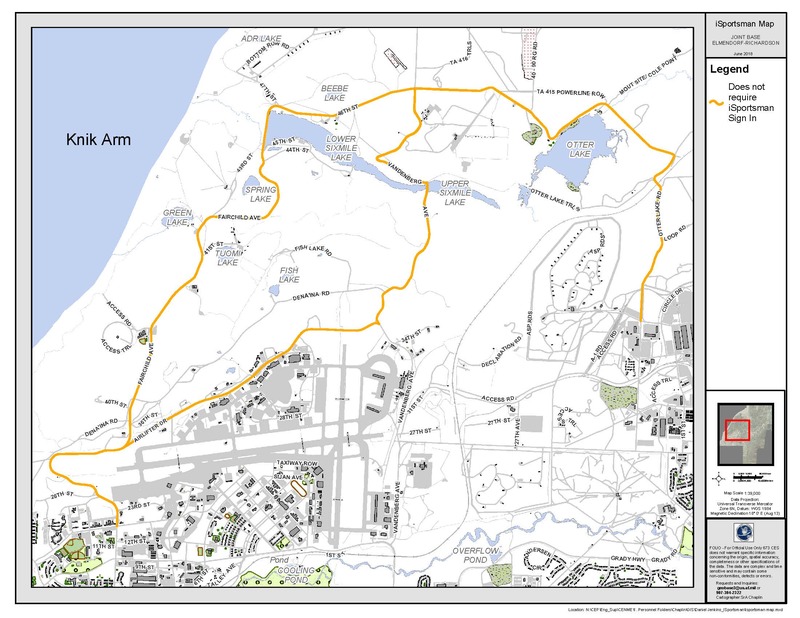 Recreation permits are required to recreate in undeveloped portions of JBER, with the exception of Morale, Welfare and Recreation (MWR) sponsored events or facilities and WITHIN THE ROADWAYS of the following routes: Fairchild Ave, 46th St, Vandenberg Ave, Airlifter Dr, and Otter Lake Rd from the Fort Richardson main Cantonment to the intersection with 46th St and Vandenberg Ave. CLICK HERE for a map of these routes. For example, camping and boat rental through MWR or picnicking at Otter Lake are exempt from iSportsman requirements, but hunting/fishing or harvesting anywhere on JBER requires an iSportsman recreational permit and state-issued hunting/fishing license, even when conducted at an MWR facility/event or military sponsored event. Recreating on the road system outside the cantonment areas or Otter Lake, Fairchild, Talley and 46th St. also requires an iSportsman permit and to be signed in. Hiking, biking or running even when conducted on roads with the only exceptions being Otter Lake, Talley, Fairchild and 46th st.
Recreation on military lands is subject to availability and dependent on military security/training requirements. When signing into iSportsman, closed or restricted access areas will not show up as an option for recreational activities. Be aware that an installation pass is still required and that trespassing or permit violations may result in revocation of recreational privileges or more serious actions. Information about other recreation including but not limited to: hiking, cycling, picking/harvesting, sightseeing, running, photography, etc.